Blowout Sale! 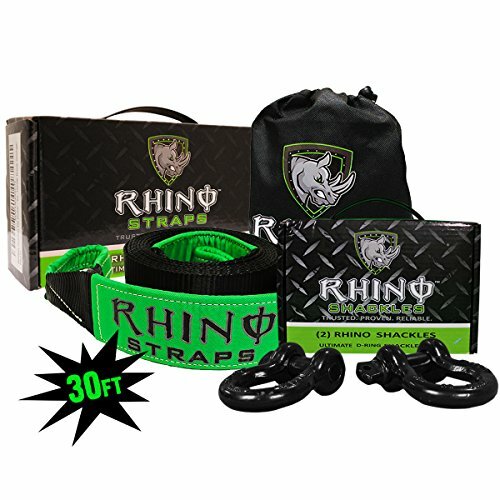 Save 55% on the Rhino USA COMBO D Ring Shackles & 30' Tow Strap (41,850lb Break Strength) - Shackle For Vehicle Recovery, Hauling, Stump Removal & Much More - Best Offroad Towing Accessory for Jeeps & Trucks!… by Rhino USA at Hosted Payload. MPN: RNO-SHACKSTRAP30. Hurry! Limited time offer. Offer valid only while supplies last. ''⭐⭐⭐⭐⭐ Amazing product! put a couple sets on my jeeps for off roading. Very heavy duty d-ring! Going to put one on my atv and truck next! ▶ 20+ TON BREAK STRENGTH - Lab Tested and Certified 41,850lbs Capacity, #1 For Sale on Amazon! ▶ POWDER COATED CHROMOLY STEEL - Sustain Good Looks & Anti-Rust Coating on ALL Rhino Products Guaranteed!